"Fock kann einen Stiefel ausrechnen"
Welcome to the homepage of the V.A. Fock Meeting on Theoretical, Quantum and Computational Chemistry and of the V.A. Fock School for Quantum and Computational Chemistry. 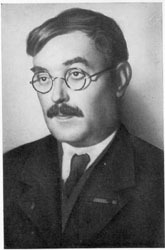 Prof. V.A. Fock of the St. Petersburg (Leningrad) University is the inventor of the Hartree-Fock approximation (First publication on the method: Z.Phys. 61 (1930) 126.). He was born in December 1898 in St. Petersburg. In December of the year 1998 we celebrated his 100-th anniversary by having the 1-st Session of the Fock School on Quantum and Computational Chemistry in Novgorod the Great - Russia (On the Russian scale it is pretty close to St. Petersburg). Here you can find the history of the School since then. 16-th Meeting will be held 1.10 - 5.10 2018 in Sochi. 4-nd Hellmann Symposium on Theoretical Chemistry.